I loved Flight of the Dragons. Didn't John Ritter do the voice for Peter? 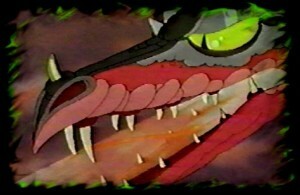 As for childhood memories, I have the Dungeons & Dragons cartoon on DVD, although that was a little after my time. My brother and I used to get up in the wee hours of the morning to watch Star Blazers (aka Space Battleship Yamato). I wonder how that would hold up now. I remember this movie from when I was a kid...but I don't remember it as well. The Last Unicorn is still a great movie. This was my younger brothers favorite film and we must have drove our parents insane switching between watching Flight of Dragon's and Star Wars while growing up. WHY IS THERE NO DVD?? Seriously. Love this film, except for the depressing conclusion when magic "loses". One of my favorites growing up, too! I loved Flight of Dragons as well although with James Earl Jones voicing both the red wizard and Darth Vader I thought all bad guys spoke in the same deep voice! 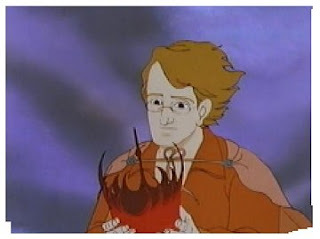 I bought it on video a few years when I still had a VHS and it actually stood up to rewatching like The Last Unicorn. I wonder if I'd feel the same now - 7 years later...? 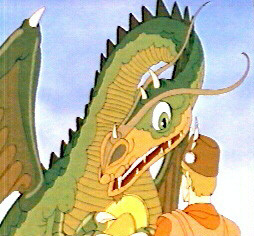 I haven't Seen Flight of Dragons since I was a kid, but I loved it then. I recently bought and watched The Last Unicorn and it was just as good as I remember. I downloaded this a while ago (Want me to buy it, film companies? Release it in my region then!) and it still holds up pretty well. The theme song is as cringe inducing as it was when I was smaller, Ommadon is creepy and horrible, Sandmirks are still weirdly effective as monsters, Aragh is still a great hero and the princess is still a wet hen with a very silly name. All nostalgia issues aside, the film is good enough to push the same buttons now as it did when I was six. Well worth, ahem, 'finding' a copy. Flight still holds up just as well today and I have watched it many times over even as recently as this month (I'm 36). My sister was a bigger fan of Last Unicorn but I got hold of a copy recently and enjoyed watching it.